A blackwater species native to Indonesian islands of Sumatra and Borneo. Mature females may be larger with a rounded belly. Unlike most Cyprinids, which are "egg scatterers", members of the Trigonostigma genus attach their eggs to the underside of broad leaves. Spawning in home aquaria is unlikely as this species requires pristine, acidic, and very soft water for successful breeding. For more information see: Breeding Trigonostigma. A shoaling fish that should be kept in groups of at least 8, but thrive in larger groups. Due to their active nature it's best to keep this species in a tank at least 24" (60 cm) in length. Keep with other small, peaceful species such as other Rasboras, Corydoras, peaceful Dwarf Cichlids, and small Gouramis. Avoid anything large enough to swallow these fish, or hyper-active species such as Zebra Danios which may spook them. Like many other Rasborinae these fish are not picky eaters, and greedily accept any food given. These fish do have small mouths however, so choose appropriately small live, frozen and prepared foods. Crumbled flake, micro pellets, and supplements of cyclops, daphnia, gut-loaded brine shrimp, and small mosquito larvae are good choices. Provide a well planted tank with shaded spots to give this species a sense of security. Dark substrates, and subdued lighting provide the most natural environment. Tolerant of a variety of water parameters as long as water quality is maintained, but requires soft, acidic water to breed. Active, peaceful, but less brazen than larger Rasboras. Smaller, but with a similar body shape to Trigonostigma heteromorpha these are distinguished by a more translucent body, much slimmer "porkchop", and slender brilliant orange line along the lateral. 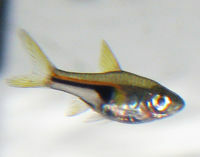 Rasbora hengeli was the original scientific name of this species described by Meinken in 1956, but was reclassified into the genus Trigonostigma by Kottelat & Witte in 1999. Google Translation of "Haltuns- und Zuchberichte – Hengels Keilfleckbärbling"